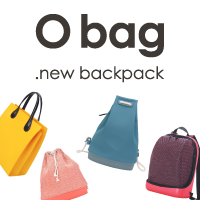 New product design contest on Desall.com: the O bag brand and Desall invite you to design a new combinable backpack, usable as a backpack or as a bag, designed for a unisex public, suitable for both work and free time. The brand O bag stems from the incredible success of the iconic and customisable bags and clocks. Today, it is leader in the customisable accessory market, offering a wide range of products made of innovative materials, such as combinable bags, watches, sunglasses and bracelets. •	Modularity and Customisation: the client has the possibility to combine several components in order to create a unique and customised product. •	Materials: the plastic material is the trait-d’union among all the O bag products that ensure a strong identity, providing versatility and functionality. •	Democratic price & Easy Fashion: the O bag mission is to create “democratic” products with an easy fashion approach, based on a variable price that can satisfy a wide range of clients. •	Design: O bag is rooted in the design world: born in 2009 at the Salone del Mobile with its iconic “O clock”, it keeps creating products that are able combine fashion with design. O bag is looking for a new combinable backpack, that thanks to some interchangeable components may be used either in backpack or in bag configuration, also allowing several customisations, in line with the brand, able to satisfy the needs of a unisex public and adapt at best to the several contexts of use. Product typology: the backpack you design shall be a combinable product, that requires the assembly of different components selected by the user during the customisation of the backpack in order to get a highly customised product, suitable to several contexts, that is for backpack/bag configuration, man/woman, for use in office, city, school or travel. In addition to the body of the backpack – mainly made of XL EXTRALIGHT® material – and to the shoulder traps/handles that constitute the basic configuration, you are free to suggest other components of your choice to give life to several configurations the user can choose during the purchase, with the relevant price variation given by the selected components. Backpack body: to ensure continuity with the style and identity of the O bag brand, the backpack shall consist of a rigid element, mainly made of XL EXTRALIGHT® material and shall host several components/accessories, through a clasping system. You are free to adjoin to the rigid body a non-rigid body, as long as you comply with the indications specified in the Materials paragraph. Backpack/bag configuration: the backpack shall allow the configuration both in backpack and in bag modality, through the employment of specific shoulder straps and handles that you are invited to design. Inner bags/compartments: your backpack shall include various combinable and removable pockets/compartments, in order to organise the space available inside and better adapt to the use for which the backpack is designed. For example, for use in the office you are invited to include a laptop sleeve for a 13” monitor. According to the configuration you suggest, you are invited to propose different solutions of pockets/compartments accompanied by a short descriptive text explaining their characteristics and their intended use. Other components and accessories: with a view to increasing the customisability of the product depending on the intended use – that is for backpack/bag, man/woman configuration, use for office, city, school or travel – you are invited to suggest other components that the user may select during the configuration. These components and accessories shall not be essential for the normal use but rather be complementary to the basic version of the backpack, consisting of the backpack body, the inner bags/compartments and the shoulder straps/handles. At your discretion, you may also suggest the use of optional technological accessories, in order to enrich the user experience. Design and style: your backpack shall have a minimal design and comply with the brand identity of O bag, interpreting in a unisex product the values that most characterise it, as specified in the company description. In particular, the backpack shall stand out for its attention to design, its customisability and multi-functionality, adapting to the various contexts of use described. You may propose surface finishes realised on the mould, for example by suggesting the use of textures or other embossed elements. Dimensions: the approximate dimensions of the backpack shall be width 30 cm, height 40 cm, depth 14 cm, with a possible variation of +/- 10%. Shapes: you are free to explore the shapes you prefer, as long as they keep aesthetic continuity with the brand. Materials: the main material of your backpack shall be the XL EXTRALIGHT® material (even if not at 100%) that by virtue of its own composition allows to obtain different degrees of softness and thickness. You may also suggest the use of other materials in combination with the XL EXTRALIGHT® material, including recycled or industrial waste materials (belonging to the family of plastic materials with aspect similar to plastics or rubber), ecological, natural materials or faux fur. The use of materials of animal origin – including leather, fur etc. – is not allowed. Production technologies: the backpack will be realised with industrial production technologies. The total production cost of the product must fall in the range of 10-30 €. Keep into consideration for the backpack body that due to its very conformation, the XL EXTRALIGHT® material releases silicone material, which prevents the use of gluing, co-moulding or hot work processes. The possible use of other materials in combination with the XL EXTRALIGHT® material will imply the employment of mechanical joining processes, through stitching, punching, etc. Logo: your backpack shall give visibility to the O bag logo, provided inside the Material files. Depending on where you intend to place the logo, keep into consideration that if applied on the rigid body made of XL EXTRALIGHT® material, it will be realised directly on the mould. Target: the backpack will be addressed to a unisex public, aged between 15 and 45 years. Where to use: the backpack you design shall be used in several contexts, from office to free time, in the city, at school or while travelling. Deliverables: upload all the images that better present your projects (rendering, descriptions, CAD files, etc.) showing in at least one slide the various components and the modularity of your proposal. If necessary, remember that you can also attach a .ZIP archive containing extra materials. Participation is free of charge and open to designers and creative talents of any nationality aged 18 years or older. Participants can present one or more projects, but only the projects published on the www.desall.com web site, via the upload page related to “O bag new backpack” will be accepted. The selection of the winner by the O bag creative team will be the result of an unquestionable evaluation and it will take into account originality, feasibility and consistency with the brief presented. Do you want to stay updated about "O bag new backpack"?